Pesmel joined the list of first-time exhibitors at Tire Expo in 2018 and took the opportunity to launch its TransTire innovation, which simplifies the handling, storage and distribution functions of tire plants, without using pallets, to create significant savings in investment and operational costs. Tony Leikas, CEO of Pesmel, elaborates. Click to play video and learn more! With increasing connectivity available to tire plants thanks to smart enabling technologies, Rockwell Automation’s Connected Enterprise solutions can deliver greater efficiencies, higher cost savings and superior manufacturing intelligence to manufacturers. Dominique Scheider, strategic account team leader at Rockwell Automation, explains all. 2018 sees Trinseo celebrating not only 80 years of supplying synthetic rubber to the industry, but also the launch of an all-new next-generation rubber portfolio that includes Neodymium BR (Nd-BR), which is a high-performance technology that complements S-SBR; as well as the expansion of the company’s Schkopau plant. Mandy Merkert, the company’s marketing communications specialist, was on hand to tell us more. Want to know more about what VMI Group has been up to this past year? Harm Voortman, CEO, updates us on what was new on the stand, including the VMI XXperience, a special area in which visitors could learn about VMI solutions using HoloLens VR headsets. VMI also introduced the VMI Spare Parts Kits, which include all the required parts and installation instructions for plant owners to quickly and effectively perform correct maintenance first time, every time. 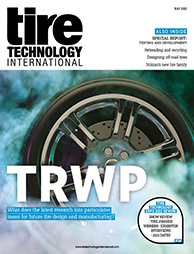 Solvay unveiled what has been described as a breakthrough innovation in the shape of Premium SW, a new highly dispersible silica set to boost durability and safety in ultra-performance tires. Thomas Chaussée, global R&I tire manager at Solvay, was on hand to tell us more about this and another product, Zeosil 1085. As VP sales and marketing at HF Group, a complete supplier of mixing room solutions for the polymer processing industry, including machines and modules, automation and all auxiliary products integrated into a total system, Ian Wilson was so busy that he only had time for a brief interview at Tire Expo. Eastman Chemical, one of the world’s largest producers of speciality chemicals, launched a brand-new product at Tire Expo, Eastman Crystex Cure, a next-generation insoluble sulphur that delivers improved productivity and operational cost savings. Lucrèce Foufopoulos, vice president and general manager at the company, explains more about some of the benefits. Comerio Ercole has been a leading manufacturer of complete machinery systems, including calendering and mixing machines, since 1885. The company brought visitors to its stand right up to date with a huge 3D-printed calendering machine used for training the next generation of calendering machine operators. Riccardo Comerio, managing director of the company, gives us more information. The world’s leading odour control specialist showcased its Aerox-Injector, which destroys odours produced in industrial processes. Just one Aerox-Injector is sufficient to treat up to 200,000m³/h and reduces smells by up to 80%. Daniel Oostema, international sales manager at Aerox, provides more details. EZ Metrology’s devices and software simplify data collection and streamline the testing process. With testing solutions available for closing efforts, wheel and engine motion, part deformation and dynamic events, the company has redefined the field of metrology. What part can this technology play in the tire industry? Tom Van Esch, CEO at the company, explains. Computype used Tire Expo to launch its latest innovation, Chromaffix. The solution is designed to seamlessly integrate with existing manufacturing workflows to consistently print and apply branded tread labels to tires. Centred on the linkage between the bead barcode label and the retail-facing tread label, Chromaffix prints variable information to combine product data with colour logos for the correct combination of static and variable label presentation. John Newton, managing director – global industrial market at the company, explains more. A regular visitor to Tire Expo, Intralox was on hand to showcase its range of single and bi-directional touchless conveying and diverting systems for green tire sorting and merging, as well as its zero-tangent curve technology for 30° and 180° turns. Jeroen Neuhof, general manager Europe at Intralox, tells us more. Another new industry launch was on display at the Metravib stand in the shape of the company’s new Xpander and automated specimen handling system for fully automated compression, tension and shear testing with one single DMA unit. Hugues Baurier, international sales manager at Metravib, gives us more details. For more than 60 years, Buss’s kneader technology has been at the forefront of continuous preparation of heat- and shear-sensitive compounds. The company’s continuous compounding systems offer uniform and controlled shear mixing, precise temperature control and excellent dispersive mixing. We caught up with Robert Hollosi, process manager, to find out more. Black Donuts’ newly appointed CEO, Derek Carruthers, takes time out of his busy schedule at the show to tell us about a new turnkey and greenfield tire manufacturing plant the company is involved with. It will be Saudi Arabia’s first tire manufacturing plant, and one of the world’s most modern, set to produce 16 million car tires and six million truck tires a year. Yet another first-time exhibitor at Tire Expo in 2018 was Korean company LS Cable & System/WirelessPower21, which provides solutions to wirelessly transmit power to enable the operation of devices mounted inside rotating tires. Ho-Jin Kim, manager at the company, explains more and gives us a striking demonstration of what is possible. As a first-time exhibitor to the chemicals and materials section of Tire Expo, Shin-Etsu Silicone Europe made full use of the opportunity to introduce its new silane coupling agents, which can provide a strong interaction between the silica and the SBR/BR polymers. Satoru Uno, sales manager at the company, was on hand to tell us more.